With its powerful electric motor and the integrated foot release, the Tak 18 electric pad stapler is perfect for stapling thick pads of up to 14 mm. 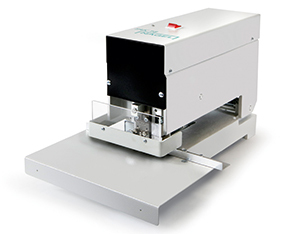 The pad stapler is made of a non-distorting cast iron body and equipped with a robust stapling head. All wear parts can be easily replaced. The back stop is infinitely variable.